Fall is such a magical time. The leaves are changing, there is cooler weather, and my favorite part: I get to bring out my sweaters! Fall is great for other reasons too: sunflowers, cozy and warm color combinations, and anniversaries. And lots of them. Trey had me recreate his wife’s beautiful bouquet that had some classic touches of fall. 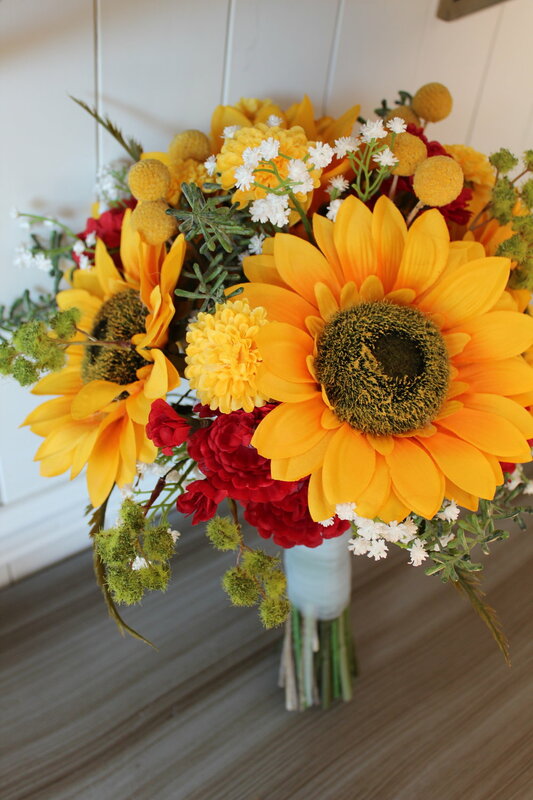 Composed of Sunflowers, Zinnias, Billy Buttons, Fern, Seeded Eucalyptus, and a little green Moss makes this for a bright and sunny fall bouquet. Trey had a good eye for detail, so when it came time for me to wrap the stems, he was able to clue me in on the original material. His wife had it wrapped in blue tulle; it was her “something blue.” Cute, right? 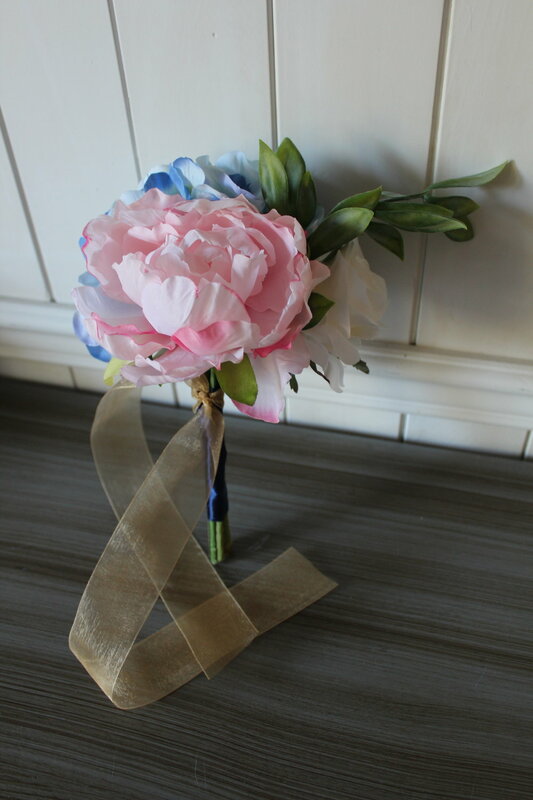 Take a look at this awesome silk bouquet recreation! Contact me today to get a free quote for a bridal bouquet recreation in silk flowers. TomiAnn chose beautiful blue Hydrangea to be in her bouquet, along with beautiful ivory Roses and pale pink Peonies. We tied it off with navy ribbon. TomiAnn had a couple meaningful elements in her silk wedding flowers, including this very special charm for an honored loved one. She ordered this from another vendor and had me add it to the bouquet. The Maid of Honor bouquet included the same ivory roses and pale pink Peonies. We tied it off with a sheer gold ribbon for a touch of shine and to match her navy, gold and pink color scheme. We incorporated all the colors into the boutonnieres and corsages. We used pink roses for most of the main flowers, adding in a little blue to the mothers, grandmother and groom’s flowers. TomiAnn also had charms for the mothers and the groom’s. I especially loved this touching way to honor people in her life. If you like the color combination of pink, navy and gold in silk wedding flowers, contact me today to see what unique design we can come up with together! I've got a December birthday, thankfully for me it's early enough in the month that I get birthday presents separate from my Christmas presents. My daughter isn't quite as lucky. Her December 19th birthday means extended family celebrations are a mish-mash of holiday and birthday gift giving. At 6, she doesn't mind so much yet. But as her mom, I still have to plan ahead to make some distinction between her birthday and Christmas. If you have an anniversary around a major holiday, you too might be feeling the squeeze of gift giving. How do you make your anniversary gift separate but meaningful? Jared must have been thinking the same thing because when he contacted me before Christmas, for his January anniversary, he was really planning ahead! He sent me some wedding pictures, we talked through the flowers and I got to work. As I looked through the photos and talked with Jared about the bouquet itself, more questions came up. Jared was awesome about giving quick feedback and even asked his wife's Grandma what she remembered. He found me a more close up photo which helped even more and I was able to determine that in between the cream roses were purple Delphinium and individual blue silk flowers. The bouquet itself also had some nice details we wanted to be sure to include. The sprays of pearls were just like the original bouquet. There was also a criss-cross sheer ribbon detail on the handle of the bouquet, over the top of the white satin ribbon. Because of the stems I was working with, I wasn't able to leave as much ribbon showing on the bottom of the handle. Sometimes I have to work with the constraints of the products. But I always work to maintain the overall look of the original floral design. Jared noticed the ribbon detail wasn't quite exact but understood and ultimately approved of the final product. Jared's awesome photographer Lauren provided these images. Check out her website www.laurensphotographs.com or give her a call: 740-859-3028. Thanks Lauren for the images! If you're curious what it would take to have a bridal bouquet recreated in silk flowers contact me today to get a jump start on your gift giving planning! See the rare blue calla lily featured in the design for this beautiful wedding. Making the ladies feel special is job #1 when creating corsages. We also needed them to match their male counterparts, but look feminine and pretty. Mothers' Corsages: We wanted to kick things up a notch for the mamas. Meghan chose wrist corsages with a pretty and delicate clear beaded bracelet so they would have a keepsake from the wedding. I surrounded a single green Orchid with a bunch of ivory Hydrangea and tucked a Peacock feather and some rhinestones into the arrangement. I love how they turned out. Matchy matchy, but still beautiful! This wrist corsage was for one of the hostesses and matched with the always elegant white roses and black satin ribbon. You can't get much more classic than that! Whether you are considering adding Peacock feathers or any unusually shaped embellishment into your wedding flowers, don't think "it won't look right." Just give me a call or fill out my bridal checklist and I'll tell you exactly how it can be done! Thanks again to Meghan for working with me on such beautiful flowers! More and more I'm seeing unique elements making their appearance in wedding flowers. Whether it's feathers, jewels, pearls, paper flowers, buttons, fabric, twigs, wire, fruit, jewelry, or whatever, it can make a bouquet visually interesting and one-of-a-kind. One of the most popular embellishments making the rounds in the wedding world, are peacock feathers. The vibrant colors, whimsical shape, and soft edges make a great addition to any themed wedding. At our initial consultation I was able to show her some beautiful Hydrangeas in green and purple, Cornflowers in blue, and Orchids in green. They were all perfect matches but we still had a few pieces missing from the puzzle. She liked the look of the eggplant callas so I went to work tracking down the perfect stems and it was a great fit for the overall look and feel of the bouquets. 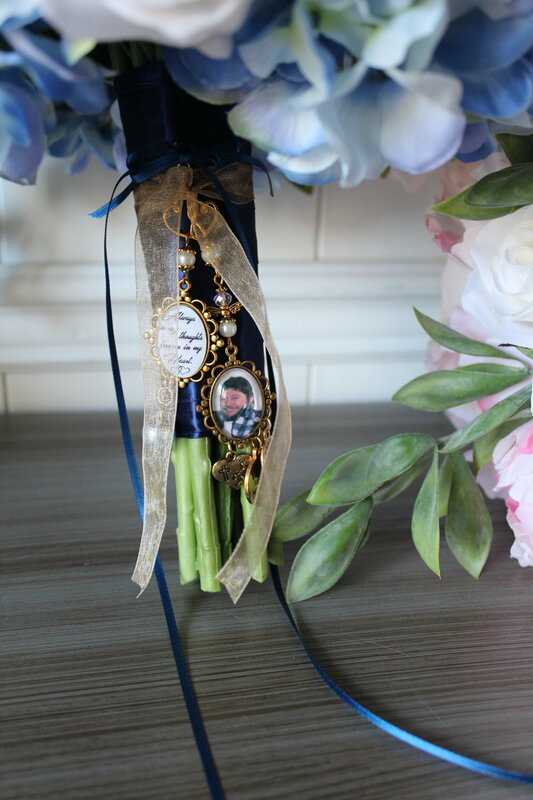 We wrapped the bridesmaids' bouquets in a beautiful blue satin ribbon and called it finished. So pretty! Meghan's bouquet was a little bit more elaborate--more feathers, more flowers, more glamor! We added in some ivory callas to bring that bridal touch to the arrangement as well as a rhinestone wrap on the stem to make it really stand out. The cutesy little toss bouquet was small enough that I decided to use some of the more linear shaped feathers so they didn't overwhelm it in all its adorableness. Feathers aren't always easy to work with, but the final look is amazing! Check back to see how we incorporated the peacock feathers in the boutonnieres in a manly, yet cohesive way. Rebekah and I had an initial consultation last spring, and as is sometimes the case, she decided to go with a different florist for her wedding flowers. Her budget was tight and she was looking for ways to stretch her dollar even further. I totally get that – in this economy everyone's budget is tight. No hard feelings and no judgement from me! So I was surprised to hear back from her just a few weeks before her wedding date. Things had not panned out and the florist she had chosen didn't turn out to be a good fit. Rebekah had specified that she wanted "a little greenery" and the bridal bouquet ended up being mostly greenery with literally only 5 flowers....5 FLOWERS! After talking through some things we came up with a plan B and I got to work to make it happen before it was her wedding day. Her colors were pink and blue with Stargazer Lilies, blue Roses, ivory Calla Lilies, and Stephanotis in her cascading bridal bouquet. We added a nice contrasting detail to the handles of all the bouquets and did a criss-cross wrap using ivory ribbon over either blue or green satin ribbon. The bridesmaids were alternating blue and green ribbon so the ivory criss-cross gave a cohesive look as all the girls stood together. So here's your lesson for the day: not all silk flowers are equal. Here at Love Is Blooming I strive to bring the most beautiful, most realistic, and highest quality flowers to each bride's arrangements, no matter what her budget. One of the most advantageous reasons to choose silk is that I can show you exact examples of flowers that will be in your arrangements so you can touch and see exactly what you'll be ordering. If you find yourself in a budgetary pinch, opt for simpler corsages and boutonnieres in favor of getting the main bouquets that are as close to your vision as possible. If someone promises you the world for a price that seems to good to be true, it probably is. And this goes for any vendor you are looking to hire for your wedding, look at their past work and see for yourself. Save yourself the time and disappointment and go for as custom as you can afford. Ok, off my soapbox I go and back to work.